HOPE – A public hearing on the application of the Hope Public School District to the Arkansas Department of Education to establish a grades 10-12 charter Hope Collegiate and Professions Academy on the University of Arkansas-Hope campus is set for Thursday at the Johnny Rapert Library Complex on the UAHT campus. The 6 p.m. public hearing concerns the proposed joint venture between the HPSD and UAHT to house and operate the grades 10-12 academy at UAHT. Hope Superintendent Bobby Hart announced the hearing Monday during the regular meeting of the Hope School Board. “We are excited about the possibilities,” Hart said. Representatives of the Hope Public School Board and HPSD administration, as well as UAHT Board of Visitors and administration, will be in attendance. 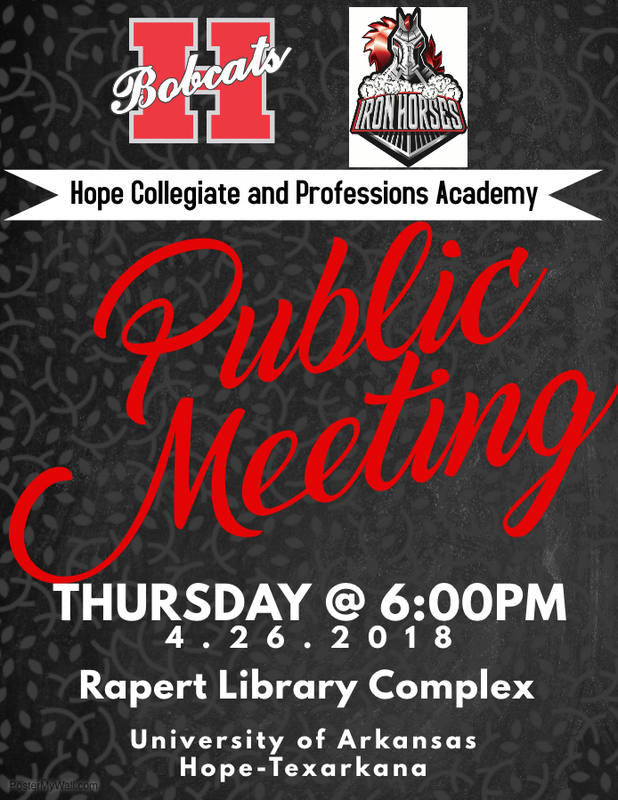 The Hope Collegiate and Professions Academy will join aspects of the missions of the HPSD and UAHT in a direct collaboration that creates a standing student body to be housed in the Johnny Rapert Library Complex. Mission and vision statements, incorporating distinguishing program and education principles, as well as values, initiatives and themes for the foundation of the proposed academy were formally adopted by the UAHT board in January. All interested parents, students, and other stakeholders of the HPSD are invited to attend.